Uni-Baby is a baby who is so smart she grew a unicorn horn out of her head. 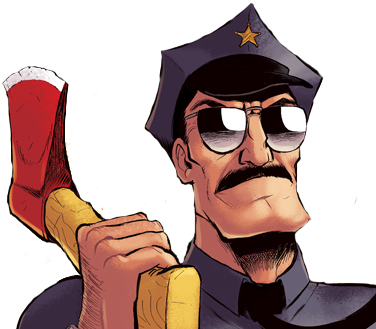 She was part of Axe Cop’s arsenal and was used to defeat the evil Psydrozon. After she joined with Telescope Gun Cop, she was bombed by Axe Cop’s lemon bombs and Avocado Soldier’s avocado bombs. Luckily she survived, but the explosion caused Uni-Baby’s horn to come off and she became a normal baby. Axe Cop and Avocado Soldier put Uni-Baby up for adoption and she was taken in by the Snoward family. When her father Uni-Man came looking for her, her horn was returned to her and she was reunited with her family on the Uni-planet.